Did you know that your house can contain up to 563.5 pounds of copper? From plumbing to cookware, copper is so versatile that it allows for a variety of uses. Not accidentally, 40% of copper world’s supply goes into constructions. Copper’s relatively low price makes it an attractive solution for several buyers. But let’s explore more into its properties and uses. Within our homes, the two most hands-on uses of copper are building wire and plumbing. Up to 195 pounds and 151 pounds respectively can be used for the said purposes. In other words, copper provides us with clean water, electricity and even AC! How could we live without them? Copper is long-lasting, resistant to extreme temperatures, it has electrical and thermal conductivity as well as anti-sparkle properties. These key features make it perfect for your home’s building wires, carefully wrapped into a PVC insulator. Moreover, copper is impermeable, resistant to corrosion and bio-static. Hence, it is ideal for your plumbing system as well, guaranteeing efficiency and hygienic standards. Not accidentally, 85% of American houses have a copper plumbing system! Copper’s softness makes it easy to shape into any sizes and forms needed to fit your home perfectly. Hardware fittings, pipes and valves can easily be moulded to compose your plumbing system ad hoc. Yet, copper is not only pipes and wires! Its softness allows you to create personalized bathroom sinks, table tops, doorknobs, handrails, door coatings, roofing and even cookware. Yes, copper does stretch to such a large range of appliances! With time, your home’s copper’s element will lose their shiny red colour as a layer of opaque green patina will form on top. But, don’t worry. This is a natural consequence of the metal’s exposure to the elements. Yet, your pipes and appliances will still be working, never losing their properties, value and efficiency. If the chemical reaction is considered aesthetically unpleasing, copper can also be mixed to form copper alloys that slow down the colour transformation. Indeed, copper can satisfy both your functional and your aesthetic preferences! At Shanghai Metal Corporation we have the products, knowledge and technologies to provide you with high-quality copper systems, whether at your home or your business. 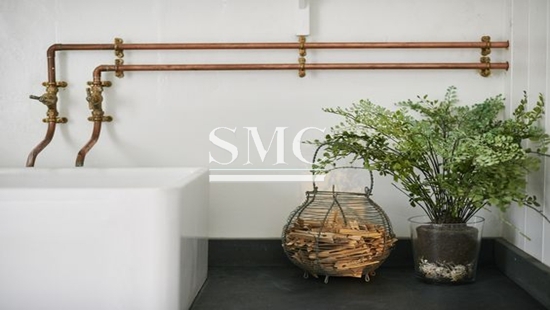 With over 30 years’ experience, SMC offers you products such as copper fittings (elbow / TEE / coupling / reducer), straight copper tubes and precision copper tubes to suit your personal needs. For more information, inquiry and a full list of products, please click here.